St. Jean-de-Luz, France. If you’ve ever been to Basque Country or contemplated a trip to the region, you’ve probably heard about the high concentration of Michelin-starred restaurants here. The first time we visited this area, along the Atlantic seaboard in southwest France and northeast Spain, my husband, Ken, and I splurged at a couple of them. 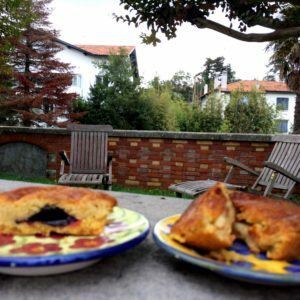 It did nothing to familiarize us with Basque cuisine – knowledge we acquired gradually over the course of our six-week sojourn. And I still cringe when I think of what those meals cost. Two years later, when we returned here for the month of October, we steered clear of such establishments. Instead, we tracked down old favorites and discovered new ones with a strategy we called “eating à la carte.” Here’s how to sample the best regional and seasonal foods without breaking the bank. Stay at a vacation rental. This can save you a bundle even if you do little or no cooking. Minimally, it will give you a place to prepare your own breakfast; refrigerate beverages and perishable picnic food; and eat dinner at least some of the time. On our first trip, we lived in Sare, a one-street mountain village, where our apartment (rented via Airbnb) was part of a 17th-century mansion that once belonged to shipbuilders. 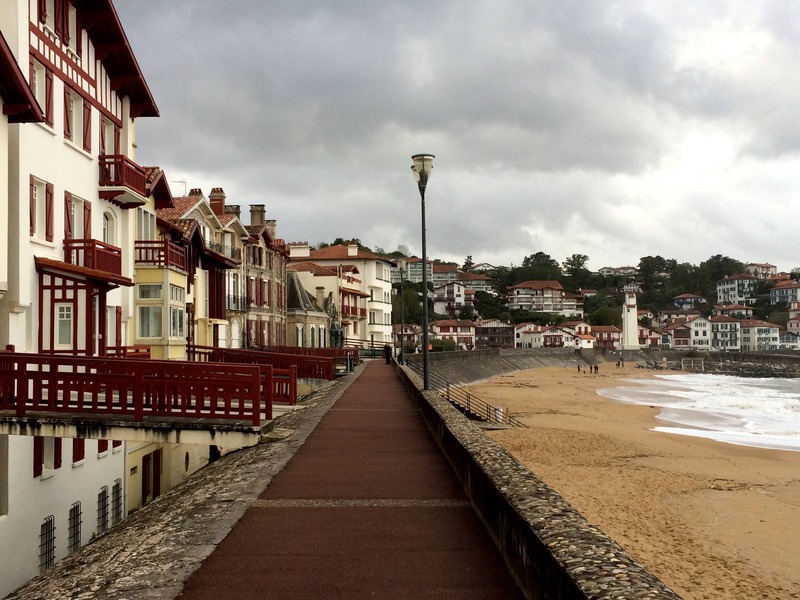 This time we chose to live in the beach resort of St. Jean-de-Luz. Our house, in a residential neighborhood, is just as spacious though not nearly as lavish. More importantly, it is an easy walk to the beach and to Les Halles – an abundant covered market. Shop at outdoor and covered markets. Rain or shine, there’s a vibrant outdoor market, on Tuesday and Friday mornings, around the perimeter of Les Halles in St. Jean-de-Luz. Look for the cheese vendor whose stand, at the north-facing entrance, always has a very long queue. 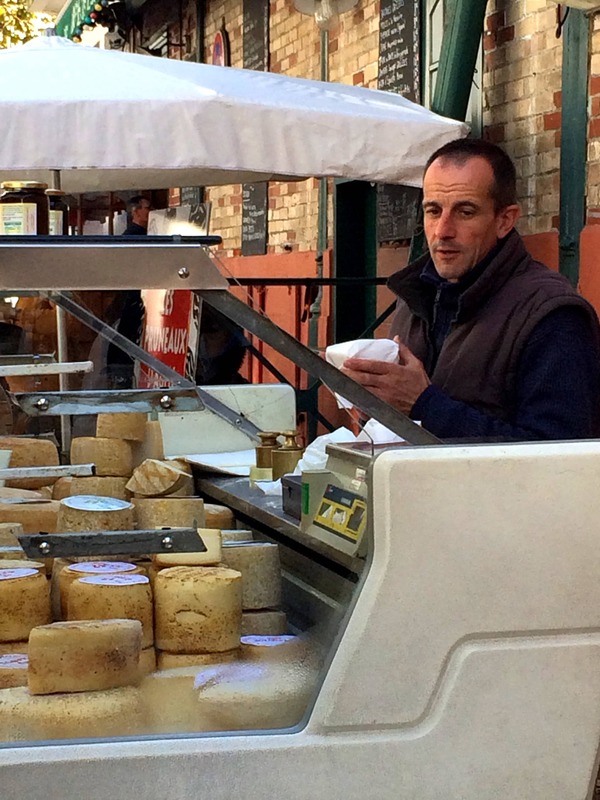 His prices for locally produced fromage brebis (sheep’s milk cheese) are the best in the market. He also sells farm-fresh eggs and black cherry preserves. The latter, which are ubiquitous in Basque Country, pair well with the region’s piquant cheeses and are no ordinary jam. They are made with cherries from the village of Itxassou, where the spring crop is plentiful enough to supply the whole region. For breakfast, we usually toast any leftover bread from the day before and eat it spread with that jam. The French call this tartine de confiture, and the preparation cost here, where bread prices are government regulated and a baguette costs about €1 ($1.18 at the current conversion), is roughly 30 cents. The same breakfast at one of the local tourist establishments will set you back €8 ($9.44), including juice and coffee. At the St. Jean-de-Luz market, and at the very scenic Saturday one along the Nive River in Bayonne, you can expand your picnic fixings with a few super-thin slices of cured ham, available from one of the charcuterie stands. They also offer a selection of saucisson – a garlicky dried sausage. The lettuce at these markets is irresistible, so how about a niçoise salad? Buy some olives from the Moroccan vendor – there’s one at each of these markets. Then pick up a jar of the preserved tuna, available at several stands. It’s a local specialty and bears no resemblance to the greasy mass we get in cans back home. Patronize prepared-food counters. Though we cooked many of our own meals, we also sampled the prepared foods that are available by the pound. You can find them at butcher shops in various villages, such as the ones in Ascain and in Espelette, and inside Les Halles (open seven days a week in the morning), in St. Jean-de-Luz. Their selection of traditional Basque foods is better than that on most restaurant menus. It’s also a great way to taste small portions of dishes that you aren’t sure you will like, such as salmis de palombes (pigeon in red wine sauce) and calamars à l’encre – squid cooked in its own ink (the dark liquid that these mollusks release as a defense when they are chased). Depending on the item, a single takeout serving runs about $7. So it is much more economical to buy your food this way and warm it in your kitchen, if necessary, than to eat all your meals at restaurants. 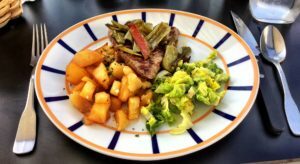 The daily fare features old standbys, like axoa (pronounced a-SHOW-a) – the Basque version of chile, made with beef or veal – along with other offerings that showcase seasonal ingredients. The coquilles Saint-Jacques that I bought for €5 (about $6) from Maison Lacabe, a purveyor at the covered market in Les Halles in St. Jean-de-Luz, was one of the best I have ever eaten anywhere. Again, watch to see what locals are buying, as we did on the many days that we stopped by that stand. Since our autumn visits coincided with the pepper harvest, it was a rare stew, braise, sauté or casserole that wasn’t threaded with julienned strips of sweet or hot peppers in shades of red and green. And if you enjoy piquillos farcis à la morue, this is your chance to indulge your passion, for €2 ($2.36) a pop. These are sweet red peppers, grown in the Basque province of Navarra, that are stuffed with codfish. Since they are time-consuming to prepare, most locals let someone else do the work. That goes for anything else made with morue (salt cod), which features prominently in Basque cuisine. To reconstitute the fish, you need to soak it for 24 hours in freshwater or milk, changing the liquid three times before cooking the fish. To prepare it à la biscayenne (in sweet red pepper sauce) takes even more time, since it requires making a pepper purée from either fresh or dried peppers. You will not want to leave the region without sampling this classic Basque dish. Graze on sweets. Basque desserts are quickly summarized. The most familiar is koka – what the French call crème caramélisée and the Spanish call flan. It’s sold in reusable clay pots at the market. So is mamia – a junket made by adding rennet to fresh ewe’s milk. And then there’s the ubiquitous Gâteau Basque (Basque cake). It looks like a small covered pie, has the consistency of shortbread, and is filled with either pastry cream or those cherry preserves you see in the market. Our favorite purveyor was La Grange à Pains, the boulangerie opposite the south side of Les Halles. But of the many sendups of this cake that I have eaten, I have yet to taste one I didn’t like: It seems that there are only good ones, and better. Be selective about restaurant meals. Here I’m looking for three things: authentic dishes, or those made with seasonal ingredients that don’t work well as a takeout meal; a good value; and the chance to eat surrounded by locals. Both meals I have had at Restaurant Euzkadi, 285 Karrika Nagusia, Espelette (one on each trip) have hit the mark in all these respects. Don’t be distracted by the fact that the village where this restaurant is situated looks like a Basque theme park. Espelette is the great shrine of chile peppers, which are not indigenous to France but were brought back long ago by the Basque seafarers. And they have since become widely used in Basque cuisine. Tour buses pull into this village each day, depositing hordes of day-trippers to have lunch and patronize the many souvenir shops. Walk right past them to Euzkadi on a Saturday or Sunday, and you will find the place filled with families who seem to be regulars. The menu changes with the seasons but always includes axoa. Euzkadi makes an especially good one, with veal that has been chopped, rather than ground, so it retains a chewy consistency. More exciting, still, are the suggestions du moment, from which we made our choices on the most recent visit. 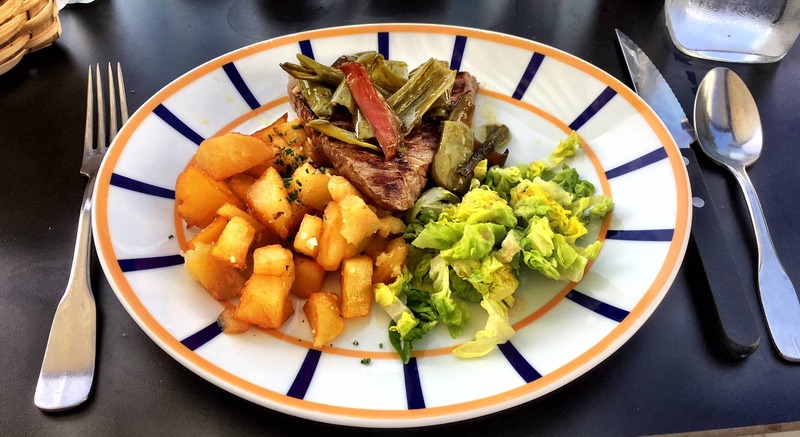 Ken’s boeuf de la ferme Iturri Alde was basically Basque-style steak frites – prepared with locally raised beef and sautéed peppers that are abundant in the markets right now. The centerpiece of my lunch was cèpes – the woody-tasting mushrooms from the Irati Forest that are very much in season. These were sautéed to perfection and served with a perfectly grilled piece of pork belly, a fried egg and enough potatoes to feed a small family. The generous complimentary hors d’oeuvres known as amuse-bouches – a puff pastry of cheese and Espelette pepper, and a small cup of white-bean soup, on our most recent visit – were the perfect accompaniment to an aperitif. I made mine a glass of Txakoli – a slightly sparkling white wine with acidic overtones that is a Basque specialty. For dessert we shared three scoops of homemade salted caramel ice cream. That plus coffee brought the total to €43.10 ($50.97). Reservations are advisable (+33 5 59 93 91 88). In good weather, ask to dine on the terrace in the back. Bon appétit! Deborah L. Jacobs, a lawyer and journalist, is the author of Four Seasons in a Day: Travel, Transitions and Letting Go of the Place We Call Home and Estate Planning Smarts: A Practical, User-Friendly, Action-Oriented Guide. Follow her on Twitter at @djworking and join her on Facebook here. You can subscribe to future blog posts by using the sign-up box on her website’s homepage.